Matt Barkley’s callback was scheduled for noon Sunday but weather conditions were making it unlikely he’d be able to perform. Behind the table we were resigned to waiting another week, for a game in Detroit, to see whether 4th quarter #Barkleytime vs. Tennessee was real or just a figment of our quarterbacking imagination. Then he arrived. A minute and fifty-six seconds before we broke for lunch, Barkley walked in. New sheet music. Less adventurous than the earlier Being Alive. He handed the pianist a jazzy, cooled up arrangement of Let it Snow. And he sang it note perfect. Note. Perfect. Reader: Enough with the metaphor. 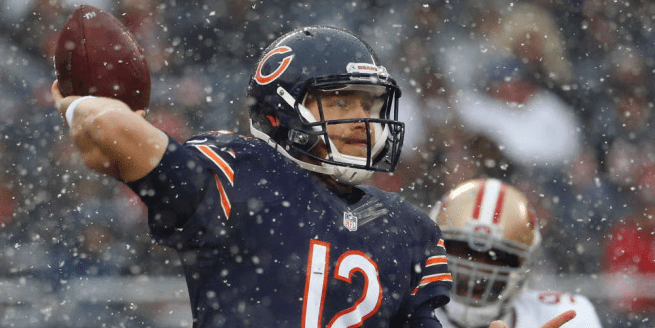 Matt Barkley has now started two games in the NFL for the Chicago Bears. And if he were a Bears fourth-round pick and not a 26 year-old “journeyman”, fans would be discussing whether Ryan Pace stole a long-term starter in the middle of the draft. Nobody was more critical of Barkley’a prospects pre-Tennessee than I was. “He can’t play” I wrote time and again. Guess what? I was wrong. He can play. And there’s a chance he can really play. #Barkleytime’s first two starts have been a better debut than any Bears quarterback of the modern era, with the possible exception of Brian Hoyer. (This sentence should get everyone off Dowell Loggains’ back.) Better than McNown, Miller, Grossman, Orton. Way better than Jay Cutler, who threw the ball four times to the Packers in his debut. Barkley got off to a shaky start against the Titans but he’s some Josh Bellamy drops away from 600 yards and a half dozen touchdowns. In two games. These were just the auditions, however. Now the Bears face a final stretch of games that could very well determine Barkley’s status within the organization moving forward. All four opponents (Detroit, Green Bay, Washington, Minnesota) are competing for the postseason. Three of the four can score points in bundles and will put pressure on the Bears offense to do the same. And perhaps most importantly, three of the four are division rivals and the Bears still have an opportunity to finish the year with a better than .500 record against their local foes. You may think this a meaningless thing but I assure you John Fox will use it as motivation throughout the offseason if they accomplish it. Detroit may be a flawed division leader but they are leaders of the NFC North nevertheless. If Barkley can lead the Bears into Ford Field and deliver another solid performance, if he can lead the Bears to another victory with a convincing performance behind center, what else could he possibly need to achieve to be considered for the starting role moving forward? I don’t know if it will happen. I still don’t think it will. But right now, I’m open to it. And that’s a long way from where I was two weeks ago. That’s how good Barkley has been through two games. And if Bears fans want to finish this 2016 campaign with intense optimism for next year, Barkley being the real deal would surely help the cause.